You are here: Home » Pescatore’s "World’s Greatest Tuna Noodle Casserole"
Pescatore’s "World’s Greatest Tuna Noodle Casserole"
It was one of those awkward social mixers at the beginning of my first semester at The University of Alabama in 1990. All the grad students were invited to the home of the one of the professors, so we could get to know each other and meet some of the faculty before the real fun began. It was here that I tasted the world’s greatest tuna noodle casserole. The dish came from the girlfriend of one of my new classmates, and she shared the recipe with me. It takes about an hour from prep to serve. It’s not a complicated recipe at all, but the results are … well, the world’s greatest. In 17 years, it’s never let me down. Boil noodles and drain. 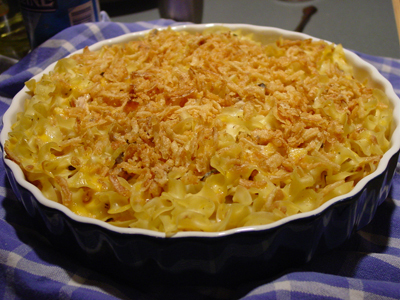 In casserole dish, mix in tuna, soup, milk, cheddar cheese. Add the noodles, then 1/2 the can of french fried onions. Delicately stir in peas (you don’t want them mushy). Bake uncovered at 325 degrees for 25 minutes. Sprinkle remaining onions on top and put back in the oven for five minutes at 300 degrees.